When I heard the rain at 4am in the morning I though – oh bugger! But lucky for all of us it stopped in time and only started raining again after the last walker crossed the finish line. I picked-up Ben on the scooter and we were lucky enough to get a parking almost next to the starting line near St. Mary’s Cathedral. The cool temperature and no sun was good for us to run and Ben could keep his smile almost all the way to the finishing line. We both liked the new course better and having started on the back of the pack gave us needed space at the begin of the race and allowed us to slowly overtake slower runners along the way – always a good feeling and helping Ben to keep going when it got though. Ben did very well in this race and we never stopped running (apart from one forced pit stop – we both must have drank a bit too much prior the start). A strong finish the last couple of km on our home run along Macquarie’s Chair, the Domain and pass the NSW Art Gallery allowed Ben to almost reach his last year time of 2hrs08min. So, now it is back to a rest and then start to train and shed a few more kilos to get ready for the City to Surf. 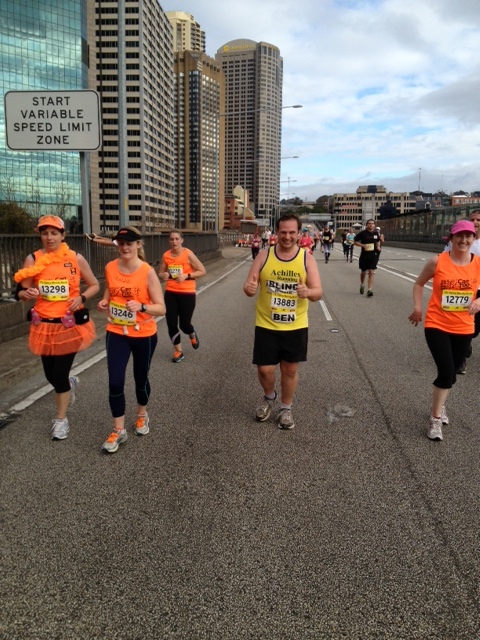 This entry was posted in Updates and tagged ben, racing, sydney by run4vision. Bookmark the permalink.